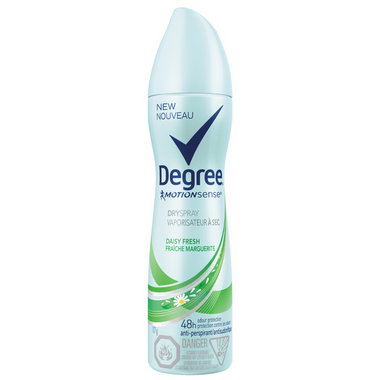 Degree Women Daisy Fresh Dry Spray Antiperspirant is the new way to get superior protection. These Dry Spray antiperspirants go on instantly dry for a cleaner feel. They are formulated with innovative technology that’s long-lasting against sweat and protects against odor to keep you dry and confident.The rate you sweat varies with body temperature, which changes throughout the day from a night-time low of 36.5ºC to a midday high of 37.2ºC. The unique formula responds to the change in your body heat and works when you need it most. Degree Women Daisy Fresh Dry Spray Antiperspirant also includes our MotionSense technology that responds directly to movement, providing you with all day freshness. Degree’s MotionSense technology is the world’s first antiperspirant with unique microcapsules activated by movement. As you move, friction breaks the capsules releasing bursts of freshness all day and keeping you fresh with every move. For best results, shake the Dry Spray can well before every use and hold 6 inches from underarm. Apply the antiperspirant to your underarm and feel the freshness. Ingredients: Butane, Cyclopentasiloxane, Hydrofluorocarbon 152a, Aluminum Chlorohydrate Isobutane, PPG-14 Butyl Ether, Parfum, Disteardimonium Hectorite, Propane, BHT, Propylene Carbonate, Caprylic/Capric Triglyceride, Sodium Starch Octenylsuccinate, Maltodextrin, Hydrolyzed Corn Starch, Hydrated Silica, Gelatin Crosspolymer, Silica, Cellulose Gum.